These Pet Rescue level 605 cheats and tips will help you beat level 605 of Pet Rescue. The objective of Pet Rescue level 605 is to rescue 4 pets and get 23,000 points. 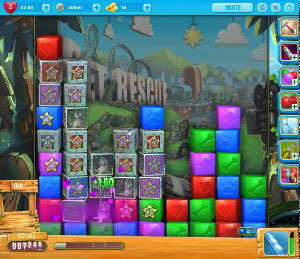 The level begins with a huge mass of caged blocks surrounding pets and a cage machine in the center of the board. Surrounding this mass of caged blocks are normal blocks that you will need to use to gain access to the center to free the pets. At first, don’t worry about dealing with the cage machine or the pets in the center. Instead, simply make whatever matches you can to reduce the amount of caged blocks surrounding the center and eventually move further down the board. As you are making your way to the bottom of the board, it is likely that you will have a number of blocks fall from the top of the board for being too high up. This is fine, however, you do not want to allow any pets to fall off, or you will lose the level. Keep an eye on what pets might be getting too high, and save your column blaster boosters to destroy high pet columns and keep the pets on the board. The cage machine will have to be destroyed at some point during the level, but all it comes down to is determining when that moment is. Wait until you reach a point on the board where you will have enough matches to charge two column blaster boosters in quick succession. Charge the first, and eliminate the cage from the cage machine. Then charge the second, and before the cage machine can build a new cage, eliminate the machine itself.